Advanced Control Systems (ACS) is a leading provider of smart grid solutions to the global electric power industry. Since our beginning in 1975 as a manufacturer of remote terminal units, to our present position as a major supplier of utility automation systems throughout the world, we have established a reputation for technological innovation and leadership in the evolution of the intelligent power grid. AP&L is a transmission and distribution electrical contractor employing more than 1,500. AREA is a member-owned and member controlled association. The needs and interests of members are always of primary concern when policies are developed. AREA encourages independent and local control of all consumer-owned electric cooperatives. Alden Systems provides asset management software to electric cooperatives. Alden One® is a secure, centralized asset database for joint use. It streamlines communication and workflows between owners and attachers. Alden One® increases the safety and reliability of infrastructure assets, while providing transparency through each joint use process. It allows companies to efficiently manage engineering resources and field operations. The result of Alden One® is the same as Alden Systems' company-wide mission: better communities through better infrastructure! Alexander Thompson Arnold PLLC (ATA) is an INSIDE Public Accounting's Top 200, regional accounting firm that provides a wide array of services for multiple client bases ranging from agriculture to small business to governmental entities and everything in-between. With 21 partners and over 180 staff members, ATA has the resources of a larger firm with the relationship skills of a smaller firm, which keeps the client at the core of our decisions. Currently, ATA audits approximately 25 electric utilities and performs well over 100 municipal audits, including non-profit agencies. Contact us today to see how we can become your long-term accounting partner. Altec is a leading provider of products and services to the electric utility, telecommunications, tree care, lights and signs, and contractor markets. We deliver products and services in more than 100 countries throughout the world. Altec Inc. is the holding company for Altec Industries, Global Rental, Altec NUECO, Altec Worldwide, Altec Capital, Altec Supply, and Altec Ventures, LLC. Powerline construction contractor including distribution, transmission and underground utilities. Storm response team. Atwell & Gent., P.A. is an electrical engineering firm that provides a variety of professional engineering services to municipal and cooperative distributors throughout the mid-South. A global leader in the design and manufacturing of custom engineered passive and active Secondary Containment and Diversion Methods. C.I. Agent products help utility companies meet the SPCC Requirements of Federal mandates and EPA Phase II Storm Water. Also check out our Water Filtration, Storm Water Diversion and Water Monitoring products. Capgemini is one of the largest technology and outsourcing companies in the world, with over 190,000 professionals. Capgemini provides a wide range of solutions, including Smart Grid, cyber security, data and analytics, testing, project management, applications development and management, asset management and resale of software and hardware at preferred prices. Created and owned by America's electric cooperative network, the National Rural Utilities Cooperative Finance Corporation (CFC) – a nonprofit finance cooperative – provides unparalleled industry expertise, flexibility and responsiveness to serve the needs of our member-owners. Governed by a 23-member board made up exclusively of electric cooperative directors and executives, CFC helps our member-owners attain their business, financial and strategic objectives through flexible, customized loan products, investment options, services, tools and training. Clearwater Payments provides full service electronic bill payment solutions to utilities of all sizes. Our highly configurable and customizable full service suite of bill payment tools enables utilities to increase their bill pay offerings bringing service, security and convenience to their customers. We're bringing the "people back into payments" by delivering a highly personalized customer experience along with superb technology. CRC is a nationwide, cooperatively owned and operated 24/7 contact call center and central station alarm monitoring center providing services to electric utilities, including energy dispatching, customer care, and monitoring of security and medical alarms including video verified substation monitoring. Davis H. Elliot Company, Inc.
Our team of over 2,100 professionals and employee-owners are dedicated to exceeding your expectations by providing you with electrical excellence. Since 1946, we have become a full-service electrical contractor specializing in overhead and underground distribution, transmission, substations, storm restoration, roadway lighting, traffic signaling, utility locating, and commercial/industrial/residential services. Education Networks of America is the leading provider of infrastructure as a service (IaaS) solutions to K-12 schools, higher education institutions and libraries. A statewide trade organization representing Mississippi's 26 electric cooperatives. These cooperatives provide electric service to more than 770,000 member-owners throughout Mississippi. ELUS Company is in our 60th year operating as an electrical utility sales representative. Our territory covers Ohio, Michigan, Indiana, Kentucky, Tennessee, West Virginia and Western Pennsylvania, as well as all states served by AEP and First Energy. EmeraChem designs and manufactures catalyst and related exhaust system components for the power generation and the oil & gas industries. Emerald Transformer is a Mississippi-based company that repairs and remanufactures transformers, regulators and reclosers. They also provide authorized repair services for Cooper Power Systems. Evluma manufactures reliable, energy-efficient LED lighting. Evluma's award-winning LED AreaMaxTM luminaire is “The Light of the Country” and the utility standard for street and area lighting. With 20kVA surge protection and Photocontrol FailsafeTM the AreaMax is truly maintenance free. Established in 1985 in Memphis, TN, Fisher Arnold, Inc. has developed a solid reputation as one of the leading engineering, architecture and consulting firms in the United States. Florida Electric Cooperatives Association, Inc.
We specialize in business relationships and development programs such as employee recognition, service awards, calendars, wearables, promotional items, government issued ID cards, corporate gifts, incentive programs, community relations, educational programs, signs and banners. Fulghum, MacIndoe & Associates, Inc.
Fulghum, MacIndoe, & Associates, Inc. is a multi-discipline consulting firm. We provide engineering expertise to clients that are in the electric, gas, water, and waste water utilities industry. Galloway Construction LLC began in 1980. Over the past 36 years Galloway Construction LLC has grown from those 2 trucks and 6 employees. We began by constructing power lines and clearing right of way under existing lines. Galloway Construction LLC continues this work today. We maintain a strong commitment to our customers along with a commitment to safety. GDS Associates, Inc., is a multi-service consulting and engineering firm formed in 1986. Its broad range of expertise focuses on clients associated with, or affected by, electric, gas, water and wastewater utilities. To promote the EMCs of Georgia by providing member-focused leadership and a unified voice through advocacy, education and communication. GridLiance is an independent electric transmission utility holding company. GridLiance partners with electric cooperatives, public power, and others to plan for the future of the grid, invest in electric infrastructure, and implement strategies that meet its partners’ ownership, capital investment, and operational goals. Hilti provides innovative solutions that boost productivity, increase reliability and minimize health and safety risks. Our well-proven cordless power tools and flexible modular panel stand systems, for instance, can make time consuming or tedious installation work much easier. Hilti also has competent, on-the-spot support across the range of utility construction and maintenance applications, our specialists are at your service throughout the TVPPA coverage area. The IMUA is dedicated to serving the interests of the state's municipally-owned and operated electric, natural gas, water, wastewater and telecommunications utilities. IMUA assists its municipal members in meeting their needs and facing the challenges of the ever changing public power industry. IPS-ENERGY systems are designed by electric power professionals for electric power professionals to provide full technical asset management (asset repository, work content definition using maintenance templates, planning, scheduling, field execution/data acquisition and analytics) with broad functionality for relay setting and testing management. The software can be licensed or offered as a service in the IPS-Cloud. Field execution can be done completely mobile or connect to the server using a web interface. Interfaces to other systems and access to other data sources can be configured using the IPS-SmartGridDI system which also provides robust asset analytics. IRBY Tool and Safety -- Your complete utility source for tool supply and repair, custom grounds, jumpers and ropes, rubber insulating equipment, certified testing services, Arc flash and fire retardant clothing. Your one-stop products, service, support and solutions provider. The public power industry is in the midst of a significant shift in how energy is generated, delivered and used. Public utilities are seeking smart grid technologies, from trusted partners, for a variety of needs: to optimize the efficiency and reliability of their delivery systems; to empower consumers to manage energy usage; and to integrate clean and distributed energy resources into the grid. We’ve listened to the needs of the public power industry, and together, Itron and Tantalus have collaborated to deliver an integrated smart grid solution built on the foundation of our proven technology. Our solution offers you a multitude of operational and control benefits—with minimized entry and infrastructure costs. Across the Southeast, Jackson Thornton Utilities consults with electric cooperatives and municipalities to design rates, create business strategies, enhance technology and provide training. Services include: strategic planning, cost of service and rate design, financial planning, organizational review, competitive assessment, special accounting services, expert testimony and employee education. The Kentucky Association of Electric Cooperatives represents all of Kentucky's 24 distribution co-ops and two generation and transmission cooperatives. It also owns and operates a distribution transformer manufacturing plant. Kentucky Municipal Utilities Association (KMUA) represents 45 city-owned utilities which provide the essential services of electric power, water, wastewater, natural gas and telecommunication services. KMUA takes pride in providing low-cost, efficient and reliable services to locally owned and operated utilities governed by city officials or independent utility boards appointed by city officials. Landis+Gyr is the leading global provider of integrated energy management products and services. Landis+Gyr offers a complete portfolio of advanced metering, load management, grid automation, meter data management and consumer engagement applications as part of its Gridstream(TM) platform. Lee Electrical is an independently owned and operated power line construction company headquartered in Aberdeen, North Carolina. The company’s commitment to professional service of high voltage power line construction has awarded it growth from the original one crew consisting of Jerry R. Lee and Robert D. Lee, to a corporation employing over 500 employees serving North Carolina, South Carolina, Mississippi and Virginia. The company’s officers and its 17 field supervisors have a combined 400 years of line experience. Upgrading our employee skills and safety consciousness are a continuous priority. Electric pole line contractor for overhead and underground utilities. Mesa Associates, Inc. is a woman/minority-owned full service multi-discipline engineering, procurement, and construction management firm specializing in providing engineering services for the electric utility industry. Eighty-five percent of our sales are in the electric utility industry with 98% of the revenue generated from repeat customers. Mesa offers one of the most experienced and capable teams available for conducting engineering studies, analyzing systems, preparing designs, specifications, schedules and cost estimates for a wide range of utility projects. Milsoft was incorporated January 1989 in Abiline, TX. It is a privately held company with employees representing the majority of stockholders. Today, Milsoft's applications are being used in more that 800 electric utilities. It is used by consultants in the U.S. and abroad, including more than 150 TVPPA members. Milwaukee Tool is an industry-leading manufacturer of heavy-duty power tools, accessories, and hand tools for professional users worldwide. The combination of incorporating innovative ideas and design with unparalleled reliability makes Milwaukee Tools unique in the power tool industry. The Municipal Energy Agency of Mississippi (MEAM) was organized in 1978 pursuant to the Mississippi Joint Municipal Electric Power and Energy Law. Current members of MEAM are Greenwood, Leland, Kosciusko, Canton, Durant and Itta Bena. MEAM sells electric power and energy to its members, who, in turn provide electric service to approximately 25,000 residential, small and medium industrial and commercial accounts. The combined populations of the six municipalities are approximately 60,000. NISC is a leading provider of software solutions and services for utilities and telecoms. NISC offers advanced, integrated solutions featuring automated workflows, electronic approvals, and more in areas billing & customer service, accounting, engineering & operations, meter data management, payment channels, cyber security and eServices / Apps. Over twenty million consumers in 50 states receive utility or telecommunications services from over 820 companies utilizing NISC advanced solutions. NewGen Strategies and Solutions, LLC, is a management and economic consulting firm specializing in serving the utility industry and market. We provide financial, valuation, strategy, expert witness, stakeholder and sustainability consulting services to public power clients across the country. Our expertise includes litigation support in state and federal regulatory proceedings, utility business and financial planning; and strategic planning for electric, water, wastewater, solid waste and natural gas utilities. NorthStar has served the utility market for more than 30 years. We deliver integrated solutions for utilities' billing, customer information, financial and meter data management needs. More than 240 customers in North America and the Caribbean use NorthStar CIS and MeterSense MDMS to manage revenues, deliver superior customer service, improve efficiencies and reduce costs. NorthStar Utilities Solutions is a division of Harris Computer Systems. NRTC leads and supports its more than 1,500 members by delivering advanced technology solutions. NRTC offers Utility, Broadband and Video Solutions that strengthen member businesses and promote economic development in rural America. The Utilities Division serves as the provider of all standard industrial utilities at the Oak Ridge National Laboratory and plays an integral part in the daily lives and livelihood of all employees. Day in and day out, the success of almost every research project at the Lab depends on our ability to provide reliable utility services to the campus. These services include electrical distribution, chilled water production and distribution, steam production and distribution, sewage collection and treatment, storage and distribution of potable, fire, and process water, natural gas distribution, production and distribution of compressed air, and storm water control. If you have any questions, please contact us and our professionally trained staff will gladly assist you. Open Systems International provides open, state-of-the-art and high-performance automation solutions to utilities worldwide. These solutions include Supervisory Control and Data Acquisition (SCADA) systems, Network Management Systems (NMS), Energy Management Systems (EMS), Distribution Management Systems (DMS), Outage Management Systems (OMS), Generation Management Systems (GMS), Substation Automation Systems (SA), Data Warehousing (Historian) Analytics, Situational Awareness Systems, individual software and hardware products, and Smart Grid solutions for utility operations. OSI is headquartered in Minneapolis, Minnesota, USA. OSI’s solutions empower its users to meet their operational challenges, day-in and day-out, with unsurpassed reliability and a minimal cost of technology ownership and maintenance. Osmose helps pole owners lower the costs, manage the risks, and improve the performance of their outside plant through a unique combination of predictive and preventative maintenance, and engineering and design services. Osmose assists telecoms and engineering firms with pole loading analysis, make-ready and pole replacement design. PCA exists to provide services to organizations involved with the transmission and distribution of energy. PCA focuses on transmission and distribution engineering, environmental engineering, surveying, construction oversight and consulting. Service TVA distribution utilities, PCA provides wholesale and retail rate analysis, power supply studies and assistance in many other daily operations. Power Delivery Alliance is the leader of an extensive consortium of construction and vegetation management companies specifically designed to assist utilities in emergency power restoration situations. It has established partners in numerous states providing proximity for rapid deployment in an emergency situation. Power Solutions Group is an Electrical Maintenance and Engineering company with a focus on safety. We have over 200 years of combined experience in the electrical industry between our four offices located in the eastern half of the U.S.
Red Clay is an Atlanta-based leading consultancy for utilities, delivering technical and business solutions on Customer Information Systems, Customer Experience, Meter Data Management Systems, Mobile Field applications, Lodestar, and Load Profiling & Settlement. With over fifteen years of industry experience, Red Clay can find the right solution for you from implementing your new systems to managing them long term. Our team of experts deliver successful projects every time. Sensus is a leading provider of grid optimization solutions for investor-owned (IOU's), public and cooperative (co-op) electric utilities. Sensus can deliver the crucial components for a utility's smart grid vision, with both products and services, to address their specific requirements. Sensus' suite of grid optimization solutions and services includes utility communication networks, smart metering, distribution automation, management software, lighting control and hosted services. Our solutions make operations more efficient and meet the requirements for increased network bandwidth, greater coverage, strong security and mission-critical reliability. Service Electric Company was incorporated in Tennessee in 1945 as an Industrial-commercial electrical contractor specializing in the construction of electrical transmission and distribution systems, power substations, and switchyards. We employ a well trained and experienced IBEW union workforce focused on quality and production. Service Electric Company management as well as its field personnel are dedicated to Safety and Customer Satisfaction at all times. Service Electric Company Construction Crews are equipped to handle up to and including 765KV, as well as having the resources to handle any industrial/commercial electrical project. Over the last 40 years, Solomon Corporation has earned a reputation for dependable equipment, reliable people, and unmatched service. Our steadfast commitment to our customers – from rural electric companies to electrical contractors to large electric utility companies – has helped us build this reputation. We specialize in sales and service of oil-filled transformers, distribution transformers, voltage regulators, and reclosers. Our equipment is custom-designed and built by knowledgeable engineers, and our service and technical support is available around the clock. Southwest Electric Co., has been a leading multi-faceted, privately-held, company in the electrical services and equipment industry, for energy generation companies and a wide variety of industrial markets. With nearly seventy years proven performance in the market, the company offers a deep breadth of engineering and design services for custom product development as well as extensive services including: national field service, commissioning and preventive maintenance, as well as in-house repair and specialty OEM logistical services. For more than 75 years, Sumter Utilities, Inc. has served as the power contractor of choice for investor-owned utilities, electric cooperatives, and municipalities. We deliver high-quality electrical construction services, products and total electrical systems integration, including construction, maintenance and modification of Transmission Lines (69 kV and above), Overhead Distribution Lines (up to 34.5 kV) - Overhead & Underground, Substations and Solar Power Cell Fields. Swift Industrial Power provides turnkey AC and DC power services to utilities, telecoms, data centers and wireless carriers across the Southeast and the United States. We provide in-house sales, service, maintenance, emergency support and EF&I services, and represent a variety of manufacturers in the DC power industry. Tantalus provides a two-way, real-time data communications network platform to monitor and control electric, gas and water utilities. TUNet® – the Tantalus Utility Network – is an end-to-end WAN/LAN/HAN communications system that operates with 220 MHz RF, 900 MHz RF, and IP-based networks including Fiber, WiMAX and GPRS/cellular, either individually or in combination. TUNet’s utilizes distributed computing technology to support advanced applications such as automated metering, outage management, power quality monitoring, load control, and distribution automation applications that are both cost-effective and practical to deploy throughout urban and rural service areas. For more information, please visit www.tantalus.com. The Tennessee Valley Industrial Committee (TVIC) is the voice of large, energy-intensive industry in the Tennessee Valley Authority power service area that purchase electricity directly from TVA. TVIC's primary mission is to seek and maintain competitive electric rates from TVA in order to preserve and expand jobs in the region. Distributor of transmission and distribution electrical products. Utility Training Services, Inc. is a team of consulting and training professionals dedicated to providing exceptional professional and technical training to electrical utility personnel nationwide. 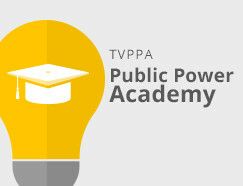 The majority of our training is offered to utilities through partnerships with state and regional membership organizations – such as TVPPA. Manufacturers representative for safety, industrial and utility products including FR and ARC Rated PPE. Vanderbilt University, located in Nashville, Tenn., is a private research university offering a full-range of undergraduate, graduate and professional degrees. Versalift Southeast is a company-owned distributor of Versalift high-reach equipment that occupies several assembly, sales and service facilities in the Southeastern United States. As the Southeastern region's distributor for Versalift truck-mounted aerial lifts, cable placers and digger derricks, we operate locations in Tennessee, Georgia and the Carolinas. Putting our customers' needs first helps them to address the tough challenges that occur in electric utility, telecommunications, tree care and other industries. The strength of multiple manufacturers and extensive inventory enables WESCO Distribution to tailor utility products and services specifically to the customer’s needs and project requirements. WESCO also provides utility supply, sourcing, and materials management for maintenance and power plant operations. Whatever the size, WESCO serves customers on both the national and local levels with a wide range of utility products.